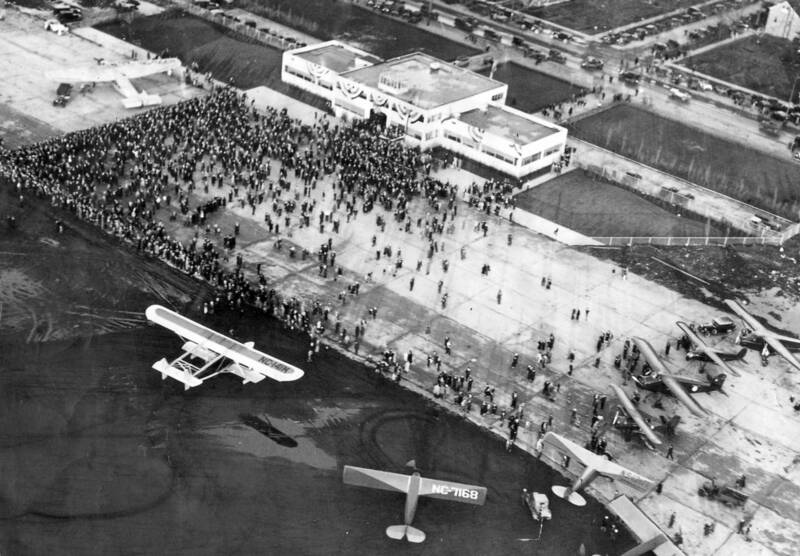 November 15, 1931 – Chicago Airport, today’s Midway International Airport, opens in ceremonies held in front of the new $100,000 passenger terminal at Sixty-Second Street and Cicero Avenue. The head of the Illinois Aeronautics Commission, Reed G. Landis, presents Mayor Anton Cermak with the state’s first state airport license. Also on hand are M. C. Meigs, the chairman of the Chicago Aero Commission and Walter Wright, the city’s superintendent of parks and aviation, the man who led the construction of the $774,000 airport. The highlight of the event is the demonstration of the use of radio in flight as Pilot S. J. Nelson of United Airlines flies over the airport and broadcasts a message that can be heard over the terminal’s public address system. At the conclusion of the ceremony Mayor Cermak takes his four grandchildren on a plane ride, courtesy of Century Air Lines.